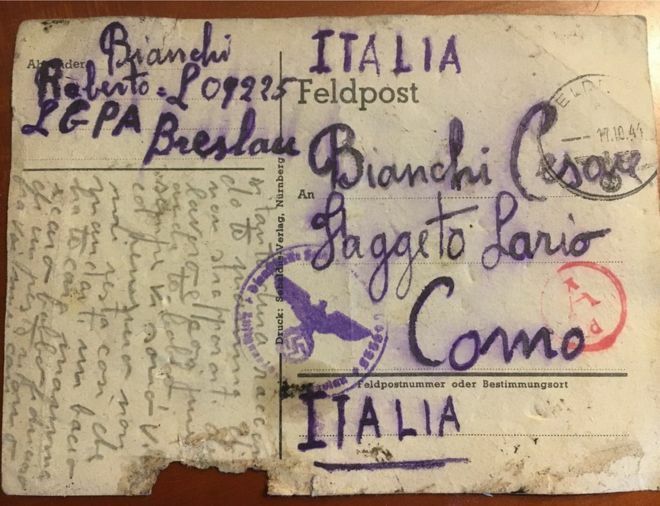 A postcard written from a Nazi labour camp in 1944 has been delivered to the writer's family after being found in an Italian street. 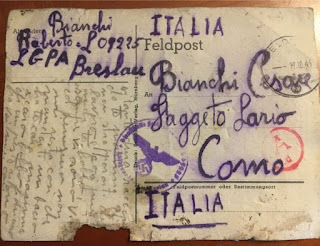 Valentina Romano, from Como, found the postcard on the pavement and was intrigued by the postmark featuring a Nazi eagle. The card was signed by Roberto Bianchi and sent from Breslau, now Wroclaw in Poland. "My dear parents," he writes, "after a long silence, this is me letting you know that I'm now at another site where I work on the land. I'm in the open countryside, in a farmhouse. I've got plenty to eat, so don't worry at all - I'm very well." Sending love to his parents and grandparents, the soldier concludes: "I'm always close to you in thought. There's nothing left for me to do except send you a kiss, dear mum and dad. I trust that I will soon return to you." Ms Romano, a teacher in Italian and Latin, was determined to find the mystery writer's family and used Facebook to help track them down. A journalist friend working for local TV station Espansione suggested Ms Romano should make a TV appeal, and a few days later the writer's family got in touch. Delighted, the teacher delivered the card to Roberto's 74-year-old cousin, Roman Bianchi. She told the BBC: "When I handed over the postcard, they were so grateful, happy and emotional. I was happy to be told that Roberto had managed to get home and lived a long life. Roberto Bianchi was born in 1924, and taken prisoner by the Nazis as a 20-year-old soldier. He survived the war and returned to the small town of Faggeto Lario, where he married and stayed for the rest of his life. He died in 1999. "We did not know of the existence of this postcard. Reading the words of our cousin has awakened old memories - it was a great thrill for all of my family", Roman Bianchi told the Italian Huffington Post. He said the card had been kept in his cousin's old house, and that the current occupant had emptied out everything. The relic would have been pulp by now, had it not blown away and settled in the path of Ms Romano. Ms Romano told the BBC she hoped the 74-year-old would visit the school where she teaches, ‘to tell my pupils about that part of history that no-one should ever forget’.